Vitamin E enhances the activity of a wide variety of vitamins and minerals. It is a fat soluble vitamin, which can assist the body with vasodilation and anticoagulation. Vitamin E is part of the antioxidant group of vitamins. 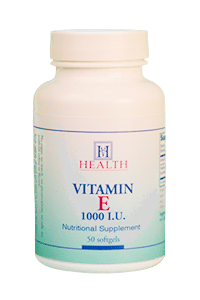 Vitamin E 1,000 i.u. is an essential part of nutritional health and helps to protect the body from infection, helps to protect cells against damage and aids in the healing of wounds. Adults, take 1 softgel daily. Check with your physician before using if you currently take blood thinners or follow an aspirin regimen.